Both sides of the Florida Straits are preparing for a world without Fidel Castro. The Bush White House is poised to enforce new get-tough measures to hasten that day along. As of June 30, Cuban-Americans will only be able to visit home once every three years, and practically all previously approved travel to Cuba by U.S. citizens will be eliminated. While on the island the 77-year-old Cuban leader is going public on what he sees as life after Castro. And he doesn't think things will be any different than they are now. Reading a 33-minute open letter to President Bush in front of a cheering crowd of 200,000 supporters on Monday, Castro declared a U.S. military victory over Cuba is not possible. "In the event of an invasion, my absence due to natural or other causes will not affect our ability to fight and resist firmly," he said. Seemingly preparing his followers for the worst-case scenario, Castro has made a U.S. military threat and his death themes of every public appearance since the start of the Iraq war. "Every political and military officer at every level and every individual soldier, is a potential commander-in-chief…" Castro declared in a reference to his own official title, Comandante en Jefe. Castro charged Monday that the Bush Administration has plans to invade if he dies in office. He took the White House to task for saying the "first hours will be decisive" with the idea of going to any lengths to prevent a new pro-Castro political and administrative leadership from taking charge of the country. "Since you can only do this, by sending troops to occupy key positions in the country, you are announcing your intention of launching a military intervention," Castro charged. 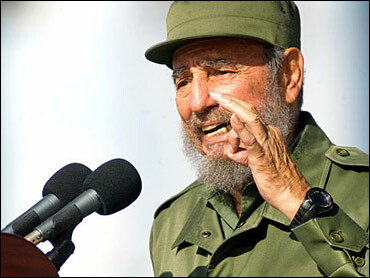 Castro, who has led his revolution for the past 45 years, informed Mr. Bush that the succession is already in place. "You will not have even one day, one hour, one minute or one second to prevent the political and military leadership of the country from taking charge immediately for the orders on what should be done have already been given," he said. The U.S. has repeatedly denied any intention of militarily attacking Cuba. After listening to the speech, a U.S. official told CBS News: "Mr. Castro's speech was a retread of old themes: Cuba as victim, claims that the U.S. is planning to invade, Bay of Pigs, the achievements of the Cuban revolution." The official, who asked not to be named, said Castro's problems are domestic. "Half a million Cubans signed up in 1998 to get out of Cuba and resettle permanently in the U.S. Seems Mr. Castro is more concerned with creating an external boogeyman than in figuring out how to put food on Cubans' plates." Castro also brandished the threat of a mass exodus to Florida shores as a deterrent to military action. He said military action could send Cubans to the seas, and his government might not be able to control the situation. This is the second government-organized protest of the stiff embargo restrictions, and the second open letter from Castro to Mr. Bush. The first, a march of a million Havana residents, took place May 14. A Cuban-American currently visiting Havana agrees. He plans to defy the new regulation and stay nearly another month past the June 30 deadline. Under the new rules, Cuban-Americans can only make 14-day visits to their country of origin. "The historic exiles, the ones who left in the early '60s and have most of their relatives in the United States, support the new measures. But the rest are angry at the White House for legislating their family relations," he said after asking, for obvious reasons, not to be identified. Florida officials and businessmen have commissioned studies to predict Cuba's future, and the business opportunities that could open up in a post-Castro world. One recent gathering in Coral Gables even discussed how expensive and difficult it might be to open Coca-Cola bottling plants on the island. Some states, however, are unwilling to wait and have begun the limited trading in food and agricultural items now allowed. The Minnesota Department of Agriculture, for one, has been encouraging its state's sales to the island right now and pushing for a lifting of all trade restrictions. The reason: They estimate Minnesota farmers could get $45.5 million in new exports and the state total economic benefits of nearly $92 million, including 900 news job, if the economic and trade embargo was lifted. It's the votes of these farmers that Mr. Bush stands to lose if he continues his current Cuba policy, say locals. "There's room for American products and tourists in Cuba right now," said Victor Hernandez, a hotel worker attending the protest rally. Waving his hand in the direction of the U.S. Interests Section directly behind the stage where Castro was speaking, Hernandez added, "Things will get really bad here if they really put these new laws into effect." Portia Siegelbaum has been the CBS News producer in Havana since February. She has covered the story of Cuba for more than 10 years. During that time, she worked on a number of documentaries on Cuba for Discovery and the BBC.